Plan on taking a break from your “dining in” resolution this month. 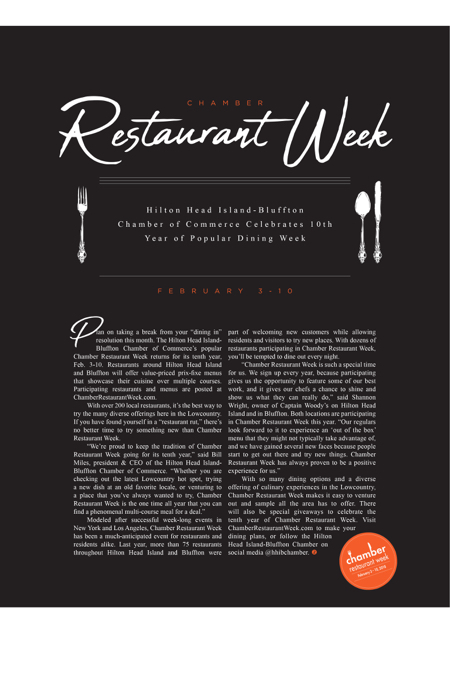 The Hilton Head Island-Bluffton Chamber of Commerce’s popular Chamber Restaurant Week returns for its tenth year, Feb. 3-10. Restaurants around Hilton Head Island and Bluffton will offer value-priced prix-fixe menus that showcase their cuisine over multiple courses. Participating restaurants and menus are posted at ChamberRestaurantWeek.com. With over 200 local restaurants, it’s the best way to try the many diverse offerings here in the Lowcountry. If you have found yourself in a “restaurant rut,” there’s no better time to try something new than Chamber Restaurant Week. Modeled after successful week-long events in New York and Los Angeles, Chamber Restaurant Week has been a much-anticipated event for restaurants and residents alike. Last year, more than 75 restaurants throughout Hilton Head Island and Bluffton were part of welcoming new customers while allowing residents and visitors to try new places. With dozens of restaurants participating in Chamber Restaurant Week, you’ll be tempted to dine out every night. With so many dining options and a diverse offering of culinary experiences in the Lowcountry, Chamber Restaurant Week makes it easy to venture out and sample all the area has to offer. There will also be special giveaways to celebrate the tenth year of Chamber Restaurant Week. Visit ChamberRestaurantWeek.com to make your dining plans, or follow the Hilton Head Island-Bluffton Chamber on social media @hhibchamber.